På Svenska! Having trouble viewing the site with chrome, please try firefox or safari! The Modern Theatre / Moderna Teatern is all about film, tv and virtual reality this year!! And Oh, yes also one theatre play, in Sweden and New York! We have a Icelandic feature in pipeline, with Scandinavian and American actors with a top notch Hollywood screen writer as a co-writer on it! And we just got selected to this fantastic pitch-forum http://thefinancingforum.com/selection with our tv-series ”Finding your way home”, about what the lack of ethics and empathy in a group of tweenies can lead to, when there are no grown ups around. And about finding your way home to your own inner values. The Modern Theatre make productions and facilitates projects in theatre, film and new media – like virtual reality. Read more about the productions during 2017-2019 further down. The Modern theatre produced and played the popular music-theatre ”Harriet L.” by Agneta Elers Jarleman where Jannike Grut played the lead as the poet and painter Harriet Löwenhjelm. The play was loved both by critics and audience. For three years, The Modern Theatre also produced an outdoors theatre piece in Lund/Skåne. A Dickens-inspired, Agatha Christie-kind-of-criminal-comedy that has been seen by over 4000 people! IN VR: The Modern Theatre produces stories, experiences and Empathy Games in Virtual Reality! See more on www.dogoodgames.com fully in English. TV/FILM: We are currently also developing the teve series Finding your way home within the Empathy project. THEATRE: The Modern Theatre produces a Swedish/English theatre tour in collaboration with Unga Roma theatre from Gotland who makes modern and updated adaptations of Shakespeare for a young audience. Updates to come. The Modern Theater is a pop up-theater, without a permanent stage. The theatre engage actors for stage production, but also for assignments during conferences, seminars and workshops as well as in the planning and implementation of communication training for grown ups in fx. municipalities and in enterprises, as well as for school pupils. Among the customers: The Swedish Agency for Economic and Regional Growth, Region Halland, Södertörn University, KTH - Royal Institute of Technology, Xcenter high school, Carl Larsson, Lund Municipality, Eskilstuna Municipality, communications agency Futurniture, the Peace & Love festival, Lund Humor Festival, and private and public actors across the whole of Sweden, in Leksand, Norrköping, Gothenburg, Södertälje, Stockholm, Visby, and others. Modern Theatre was established in Stockholm in 2006 and then co-produced the show Café Problem, directed by Ulla Kassius and Marianne Goldman, at Kulturhuset. During the 2007/2008 theater played its first self-produced show, Night Sisters, directed by Josephine Lennström. 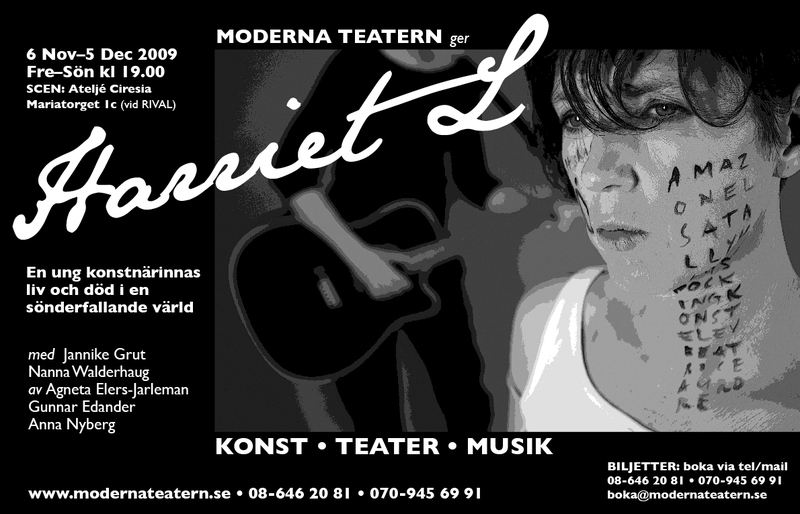 Harriet L. a play about the Swedish poet and painter Harriet Löwenhjelm, was produced in 2009. Written and directed by Agneta Elers-Jarleman. On Tour 2010-2013. The play has been played in Gotland, Uppsala and Stockholm. The documentary "Why stay bored when you can leave for more fun!?" about a relationship in a seven year itch, was shown on primetime tv both in Denmark and Sweden during 2012 and 2013. Mind The Gap - new strategies for a new era, is a form of a series of recurring half day long seminars, about how to and co-operate and produce culture in new ways. It´ pop-ups in different places and spaces around Sweden. The series started as a single seminar during the Bergman Festival at the Royal Dramatic Theatre in 2009, and after that has been in Lund two time on Kulturmejeriet in Lund. The Modern Theatre also produce communication training, conflict management and also facilitate debates and meetings.